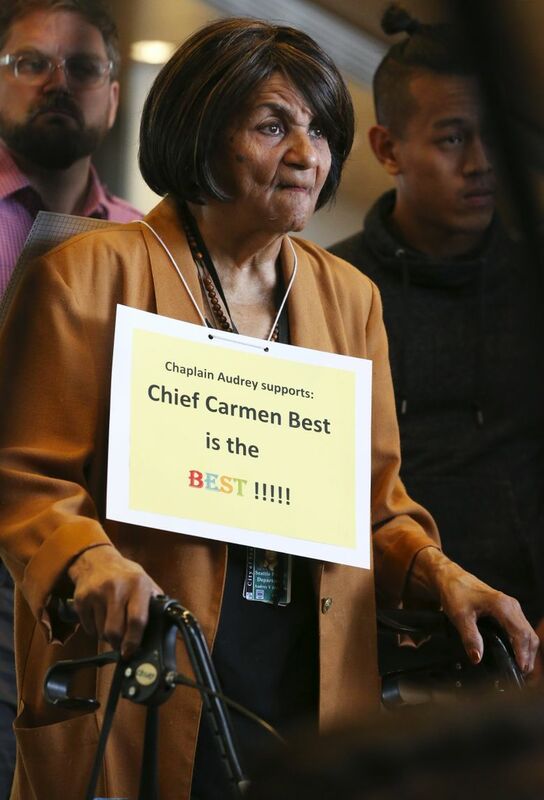 Outrage continued to build among some community activists over the Memorial Day weekend, culminating in two news conferences Tuesday in which interim Police Chief Carmen Best’s supporters denounced the outcome. Best was not a finalist for the chief job. 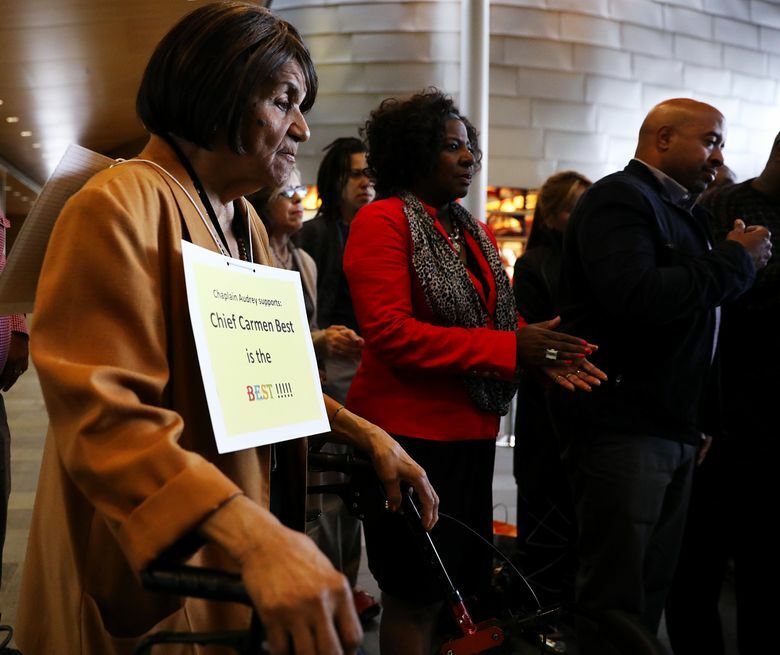 Mayor Jenny Durkan said she understands the anger among some in the city over the omission of interim Chief Carmen Best from the list of three finalists to be Seattle’s next police chief, but rebuffed demands to reopen the search. 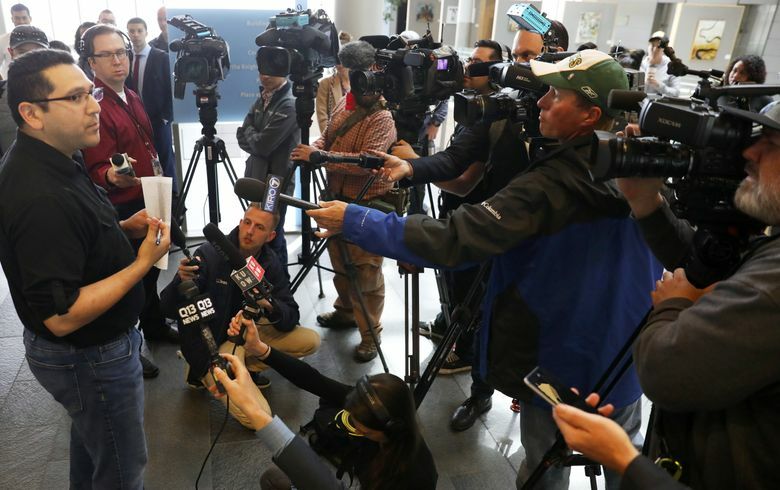 Best, who has served as Seattle’s interim police chief since Jan. 1 and was not among the finalists announced Friday, “loves the department” and wants to focus on the best plan to fight crime and carry out reforms, the mayor said. Durkan’s comments came in response to the growing outcry from some community activists and others over the search process, who believe the selection of three finalists from outside the department was flawed and mishandled. Joining in the chorus was the Seattle Police Officers’ Guild, which claimed the process was biased against Best. Durkan said she understands the frustration among Best’s supporters because Best is a “terrific person and has been great in the department at building bridges” in the community. Best, who was attending a police conference out of state, is declining interviews but stands by her statement, issued Friday, in which she thanked Durkan for giving her the opportunity to serve as interim chief and agreed to stay on until a new chief is confirmed, department spokesman Sgt. Sean Whitcomb said Tuesday. Her absence from the list of finalists drew immediate criticism Friday from some who said that Best, as an African-American woman, was being treated unfairly after playing a key role as a deputy chief in successfully navigating the department through a 2012 court-ordered consent decree with the U.S. Justice Department requiring the Police Department to address excessive force and biased policing. Outrage continued to build over the Memorial Day holiday weekend, culminating in two news conferences Tuesday in which Best’s supporters denounced the outcome and in public comments to the City Council. Some said they wanted Best added as a finalist, while others demanded the process be reopened and urged the council to step in. “Chief Best is someone … respected by all sides, both rank-and-file police and people in the community,” said Linh Thai, director of the Vietnamese Community Leadership Institute. “It’s a rare, rare thing that our city has, and she ought to be afforded with the opportunity to go toe to toe with the best and brightest,” said Thai, one of a dozen speakers Tuesday afternoon in the lobby of City Hall. The finalists for Seattle police chief are former Pittsburgh police chief Cameron McLay; Ely Reyes, assistant chief in the Austin Police Department in Texas; and Eddie Frizell, an inspector and former deputy chief of patrol in the Minneapolis Police Department. 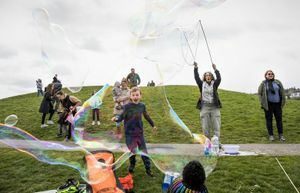 Durkan will interview the finalists, examine the results of visits her representatives will make to the cities where finalists have worked and announce her selection by late June or early July. 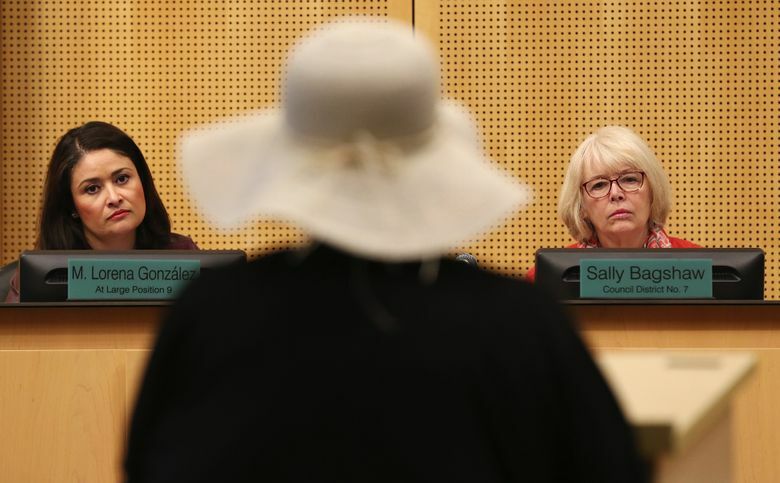 Search-committee members Sonny Nyugen and Lawrence Willis said they understand the decision is Durkan’s, but hope Seattle residents understand the committee they served on recommended five candidates, rather than three. 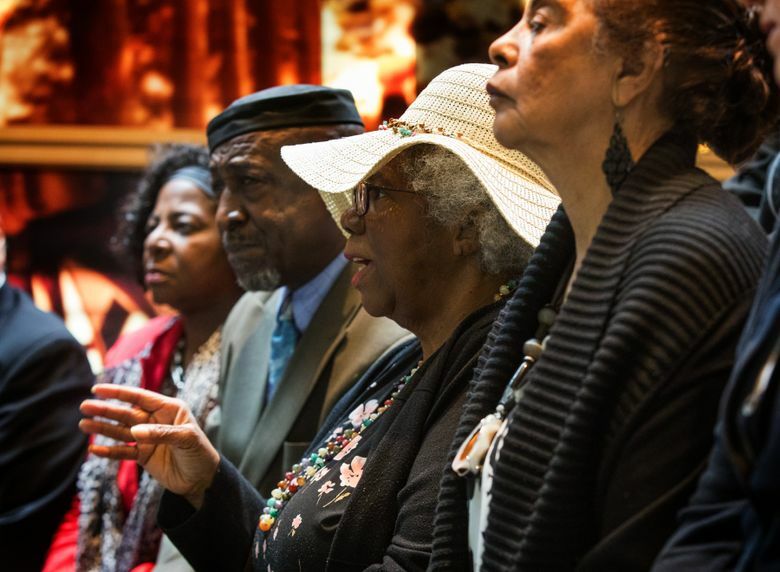 Nyugen, a Chinatown International District public-safety coordinator, and Willis, pastor at Truevine of Holiness Missionary Baptist Church, were inundated with questions from community members wondering why Best had been eliminated. “My phone stayed on all weekend,” Willis said. The list was pared to three finalists by an internal group in the mayor’s office, with input from the search committee’s four co-chairs: Jeff Robinson, a longtime Seattle attorney who is director of the American Civil Liberties Union’s Trone Center for Justice and Equality; former Councilmember Tim Burgess; Colleen Echohawk, executive director of Chief Seattle Club; and Sue Rahr, former King County sheriff and current executive director of the Washington State Criminal Justice Training Commission. The four chairs also submitted a four-page memorandum to Durkan in which they cited various strengths and weaknesses in the department, including “remarkable improvement” in the department’s training and use of force but lapses in holding supervisors accountable for failures or misconduct. Durkan, in Tuesday’s interview, said that the department faces a variety of issues beyond staying in compliance with the federally mandated reforms. Though Burgess on Friday said the need for an “outsider” candidate worked against Best, several search-committee members Tuesday said that was not a point of consensus. “We were told all the candidates were equally going to be considered,” said Louise Chernin, president of the Greater Seattle Business Association. Speaking to the council Tuesday, Public Defender Association director Lisa Daugaard said Best deserves to be celebrated as O’Toole has been, rather than doubted. She said community members expected they would get to make that case to the mayor but had that chance taken away by the internal group, questioning the transparency of the process. “You have an important gatekeeper role to play,” Daugaard said, referring to the council’s power to confirm or reject Durkan’s chief nominee. Community activist Nikkita Oliver, who ran unsuccessfully for mayor last year, echoed that point. “Why wouldn’t you want someone that the community already trusts, and that the rank and file already trust, versus bringing in someone from the outside?” he said.